A little over a month ago, I had a rheumatologist appointment. She wanted to see me in a month and I realized that would be close to Halloween. So, I made my next appointment for Halloween and, in a fit of madness, said I'd come in costume. You might remember me posting about this. I did some thinking and some Internet research. 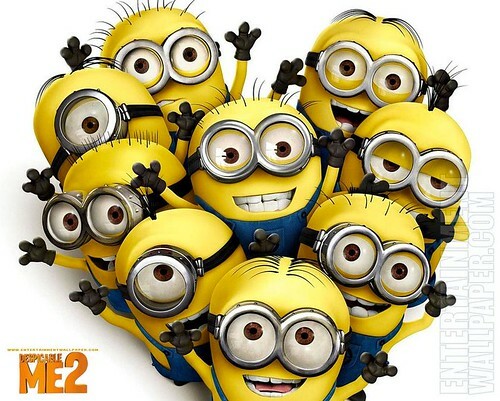 One of my favorite movies is Despicable Me. As I was thinking about what I could be, I sat down with a crochet scarf project and popped in the movie. It suddenly occurred to me. 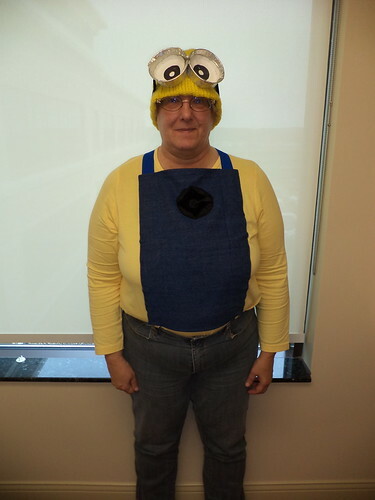 I could go as a minion. How hard could this be? Having decided upon the idea, I set about to make it happen. The minions wear overalls. I have no need of a pair of denim overalls, but, I did check to see what they might cost. $60 was the cheapest pair I could find in my size. No thank you. That alone is over the $40 limit I set for myself in making this costume. Then, I hit on the idea of making a bib and attaching it to a pair of jeans I already have. I could make the emblem the minions have on the top of their bibs and make a pair of goggles. I already had a pair of black gloves. In early October, all the pieces were procured. A hunk of denim cost me $4.50. The black fabric for the emblem cost $3.50. I bought a pair of blue suspenders at Party City for $7.00. I found a long-sleeve yellow knit shirt for $8.00 in banana color. (If you don't know why that color is important, here's the link. The first 40 seconds is all you need to watch to get the gist of why 'banana' is important.) Everything else, I had. For $25, I had a costume that was trendy, thanks to the second version of the movie coming out in the summer. The reaction today at the doctor's office was priceless. I honestly think they did not expect me to show up in costume and some of them had forgotten that I said I would. Everyone knew what I was trying to be. My boss didn't. I had to ask if my costume would "Grue" on him and then he said, "OH! Yeah! You're a minion!". The shirt I will keep and will wear again. It's very comfortable and, in the depths of winter, will be great to layer over a turtleneck. Here is the finished result, taken at the doctor's office. I forgot to bring my black gloves because it's in the mid 60's today and I didn't need them. As I rode up in the elevator to the 5th floor, I had to tuck my hair up into the hat. There were a couple of kids in the elevator with me and they got a kick out of me becoming a minion. So, this was very successful. If you'd like to see how to recreate this, there are three posts below. I'm going to hang onto this. It has potential for another year. Oh my goodness, that is too cute!